A viral video of an Oklahoma boy being bullied and kicked off his school bus is being investigated by local authorities. The footage was filmed by another student and shows the child tearfully pleading with the bus driver to stay on the bus. He can also be heard asking to be let out at his house instead of the bus stop. But the driver refuses, yelling and instructing the terrified boy to get off his bus. Once the boy gets off the bus, he is immediately set upon by the older boy and pummeled. 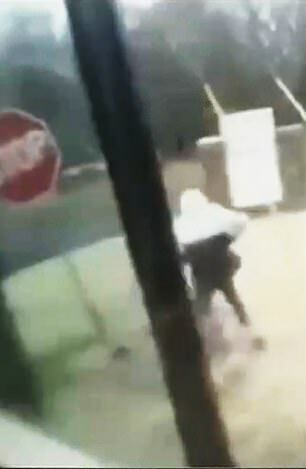 The incident occurred at the Four Corners Church of God bus stop last week and involved a bus from the Locust Grove Public Schools, News On 6 reports. Police were alerted about the incident on Thursday. 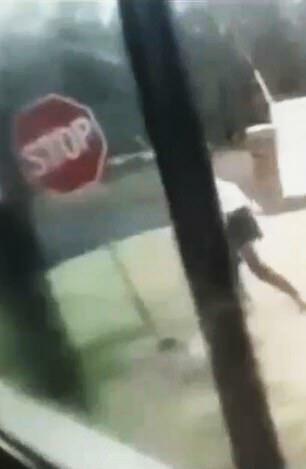 'You're gonna kill and try to punch me,' the boy could be heard stating in the video before he is yelled at to get off the bus. 'The video is alarming itself and obviously, it's enough to start an investigation,' Major Rod Howell of the Mayes County Sheriff's Office explained to KFSM. He added that investigators are also looking over addition cell phone video and two cameras that were on the bus. The school district released a statement stating that they were conducting their own internal investigation on the incident. 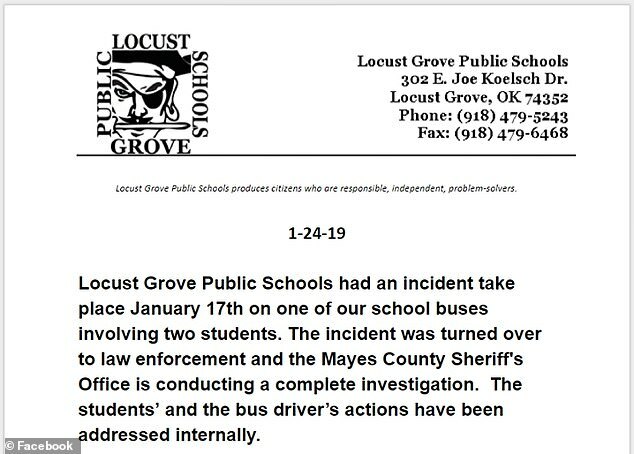 'Locust Grove Public Schools had an incident take place January 17th on one of our school buses involving two students,' the district said on Thursday. 'The incident was turned over to law enforcement and the Mayes County Sheriff's Office is conducting a complete investigation. The students' and bus driver's actions have been addressed internally.